Prepaid Gratuities on Select River Cruises*! Excursions Include: A guided hike, guided volcano experience, guided culinary walk, and a Roman clothes workshop. 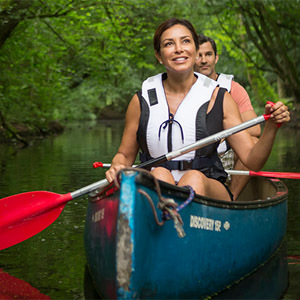 Excursions Include: A guided biking tour, paddle a canoe on a guided tour, meet an Austrian Count at his castle, and sample cheese and beer made by Trappist monks. Contact our agency to book your Active Discovery River Cruise vacation today! *Book a select 2019 Avalon Europe or Mekong river cruise and get the standard prepaid cruise gratuities included for the full length of the cruise portion of the vacation. Must be booked, under deposit and discount applied by December 31, 2019 for travel at select times in 2019. Combinable with other offers EXCEPT Travel Agent Discounts and groups. Applies to 2019 bookings only. Offer reliant on space availability. Not applicable to groups or custom tours. Not applicable on TBA space. Full cancellation penalties will apply. Additional restrictions may apply; ask our agency for details. May be withdrawn at any time.